I’m blessed to work from home about 90% of the time. Many people have this glamorous idea of what working from home is like. A lot of people think it’s more about being home and less about working. Trust me that is far for the truth at least for me. I’ve always felt like when I work from home I work harder than I ever did in an office. Working from home is a blessing but it also comes with it’s own share of difficulties. I see a lot of work from home moms that seem to really have it together. I’m not one of those! I won’t sit here and lie. If you’re looking for a pretty picture and these really organized tips this might not be the post for you. If you’re looking for tips on getting things done through the distractions then stick around and I might have something for you! This is where most posts would talk about decorating your home office in some sort of Fung Shui way that leads to peace, profits and productivity. Sounds good. Send me a link when you find that one. I live in a ONE Bedroom apartment. I share that apartment with JustaBXgirl and JustaBXgrandpa. When school is closed my niece and nephews are likely to be over. I don’t have the luxury of an office door. I don’t have four walls that are guarded by a door that keeps the ruckus at bay. What I do have is a desk, a desktop computer, a landline and a laptop that NOBODY is allowed to touch without supervision or permission (that includes JustaBXgrandpa). I have a full time job, a full time blog, an unwritten second novel and a side job that all require me to be on online and take notes. When you work from home even if you don’t have a lot of space it is important to have something to call just yours. It’s normal for me not to know where something is in the apartment because someone moved it or forgot to return it to it’s proper place. Not the case for my desk. If I can’t find something there I know I have no one to blame but myself. My desk is my main work space. It is housed in a corner of my living room. If you have a room to use that of course would be ideal but don’t think just because you don’t working from home can’t work. I have my laptop for the days where my “office” gets too loud. On the rare times that I can’t work through the madness I can simply relocate. Sometimes that means to the bedroom, the kitchen or any place that has wifi. The laptop allows me to be mobile. I’ve even “worked from home” at the Children’s Museum and The Bronx Zoo to name a few unexpected places. When I need to relocate for a few hours I grab my essentials and head out. Remember when you work from home it’s all about being productive. If one thing isn’t working try something (or somewhere) else. As you can tell I haven’t organized yet! My desk, like much of my life is what you would call organized chaos. I try to completely clean my desk once a week. Monday mornings work best for me. During the week I am pretty busy with projects, events, phone calls and life to worry about the stacks of STUFF that accumulates on my desk. Just the other day I called myself cleaning up just to have to then dig in the trash can to find a reference number I threw away in a bout of the cleaning bug. Stacks work for me. Once a week I go through EVERYTHING on my desk. On that day I organize everything into three stacks. The first is my “filed” stack. I have a growing stack of mail, notes, coupons and other paper entities between my computer and modem for quick reference. I sort through and reprioritize this stack once a month. These things are all important. I don’t have much room at home for a file cabinet. If you have room for one I suggest getting one but still going through it at least once a month to declutter. My second stack is where I keep daily essentials. I keep a long term spiral notebook for meetings and notes that I’ll be referring back to at later dates. This is mainly for my day job. However, I do use it when I have other important notes that I want to guarantee I don’t throw away (the reference number discussed above was not in here). My spiral notebook is usually joined in this stack with a planner I was gifted by my Usborne Books Team Leader. I use this planner to keep track of my blogging events and side job appointments along with any other major times I will be away from home. The third thing regularly found in this stack is a notepad. (Currently I have two on my desk.) The notepad is used primarily for jotting quick notes and making To Do lists. These are things that I don’t need long term (this is where the reference number was jotted down). I use these pads when thinking up blogging ideas, remembering posts I need written or taking quick notes from phone calls. The third stack is pretty much everything else. Mail that I need to look over. Info sheets on products I’m considering reviewing. Bills waiting to be paid. Business cards of people I need to contact and then store in my business card box. I try to go through this stack about once a week as well. Some items from this stack might stick around for a bit because I don’t have a reason to move them yet but I need them near enough to stay on my radar. By the end of the week it’s a wreck. I try not to look directly at it. I do feel very accomplished once I have it clean and organized (might last an afternoon). During the cleaning portion of the week I will also find random items that belong to JustaBXgirl that I have somehow gathered during the week. While typing this she just brought be over a Shopkins shopping bag for me to open at a later time that she has yet to disclose. I love seeing all of the perfectly prepped work spaces as I browse through social media. If that works for you GREAT. I can enjoy the feel of it but there’s something about digging through the chaos that works for me. Especially because even in the chaos I know exactly where things belong. Find the right type of organization for your space. It can be a physical organization or digital. Most people I know keep their calendar, receipts, business cards and even notes digitally. That doesn’t work for me. I have a few friends though that can’t organize their schedule any other way. I like actually writing things down on paper. I get it. Most of us working at home don’t punch in and out. Heck, I doubt most of the people working in a traditional setting aren’t punching in or out. Working from home makes work time very fluid. You might have set work hours. Or you might just have a certain number of hours you have to work. Maybe rather than hours you work by project or product. However you work it is very important to remember to separate on time from off time. I am trying to get better with my time. I am not good at punching out. I spend more hours than I would like to admit on the computer or on social media (it’s work I promise). I’m really bad at separating on and off time during the week. I’m much better at it over the weekends. On weekends I do my best not to get on the computer. Once I turn my computer on it’s really hard for me not to fall down the rabbit hole that can have me trapped for hours. Set time limits for yourself. Make lists of things you need to accomplish for the week and things you want to accomplish. Next break those list down by days. Focus on the needs and when you finish those switch to the wants. Don’t beat yourself up if you don’t finish everything on the list. There’s always tomorrow (or next week). Remember as long as there is work to do you will always have a job! Boundaries are critical for you, your family and if you’re not self employed your boss. If you are self-employed boundaries are just as critical for your clients. Before I had JustaBXgirl I had very few time boundaries with my boss despite that I worked set hours in an office. If a project called for working outside of normal hours I did it. About the only time I wasn’t available was when I was attending church. And in all honesty I have responded to emails and text messages at times from my pew. Judge me later, I’ve already asked forgiveness. Since having JustaBXgirl I have had to set time boundaries. During our busy season we get calls around the clock. I no longer accept calls after 9p or before 8a. That still might sound like a lot of time but I used to answer them at any time they came in. Since having JustaBXgirl I have blacked out days from being able to attend meetings because of her activities. Now that doesn’t mean there are never exceptions but my boss is perfectly clear that my daughter and her schedule is high priority for me. I have earned that over the years. Do I suggest everyone telling their boss they can’t do something because their child has baby ballet? Nope, you know who you work for and they know your work ethic. Just last week I had a conference call with my boss from JustaBXgirl’s gymnastics class. It was the only time he was available and we needed to talk. Will I take a call every week at gymnastics? No, and he wouldn’t expect me to. In a lot of ways it might be easier setting boundaries with your employer or clients than with your family. It is imperative to do so. JustaBXgirl knows if I am on the phone she is to be silent. She knows that because I have taught her that. It’s not magic and sometimes she forgets or doesn’t realize how loud she is but overall it works. It works so well that sometimes when she’s having a tantrum I will my phone to ring because I know she will stop crying so that I can answer the phone. Okay, now you can judge me. Either way when I sit at my desk people know I’m working. They know that means do not disturb unless it is important. It’s also important to set boundaries for yourself. I’m easily distracted. I can get lost in Facebook and the random articles I find on it that lead me to googling the most random information only to look up and realize it’s five hours later. Come on, I can’t be the only one. I give myself time limits on everything. How long will it take me to write a post. How long I can scroll on FB. How long I can shop online. Anything I have on my list gets a time limit and so does anything that randomly pops up. If I’m not finished at the end of the time period than I leave the tab open to revisit at a later time. I often will have a number of articles open at the end of the day that I have to decide to keep open to be read the following day or decide not to read. We work from home for a reason. It makes life convenient. We don’t have to waste time commuting. Heck, some days we don’t have to waste time getting dressed. I know I’m not the only one that has spent the day working in her pajamas. I love the freedom that comes from working from home. Yet, that freedom can be dangerous. I often attend blogging events during the work week. I often visit the Bronx Zoo and other children’s attractions during the work week. I sometimes meet with friends during the work week. I do laundry and other household chores during work hours. This contributes to why it’s really hard for some people to understand what working from home really means. That’s the part that people see. The part that remains unseen is when I wake up two hours early to work on a project so I can run out later in the day and catch up with a friend that’s only in town for a few hours. They don’t see when I get back from an event and spend the next four hours trying to get things marked off my To Do list from the day. Just like in other areas there has to be a give and take in working from home. And it is important if you have the flexibility like I do that you keep open communication with your boss. I let my boss know when I will be away from my desk and when to expect me back. Hope this gave you some insight on working from home. I would love to hear what are some of your tips. Great post! I really need to organize my space better, and don’t get me started on boundaries, lol. I feel privileged enough to have my own office in my home, although I can’t say I “work” from home [yet], but these tips are still really helpful, I currently try to organise my desk at least twice a week [I’m messy] and find that if my desk is a mess I tend to get nothing done, now if I could do something about my lovely mother shouting me every 5 minutes because she can’t get the tv remote to work, I’d proabably get more done. Punch Out is such a good tip. I really struggle with this one, but I’m working on it. I sit down with an intended time frame but never keep track. Maybe I should get myself an egg timer. 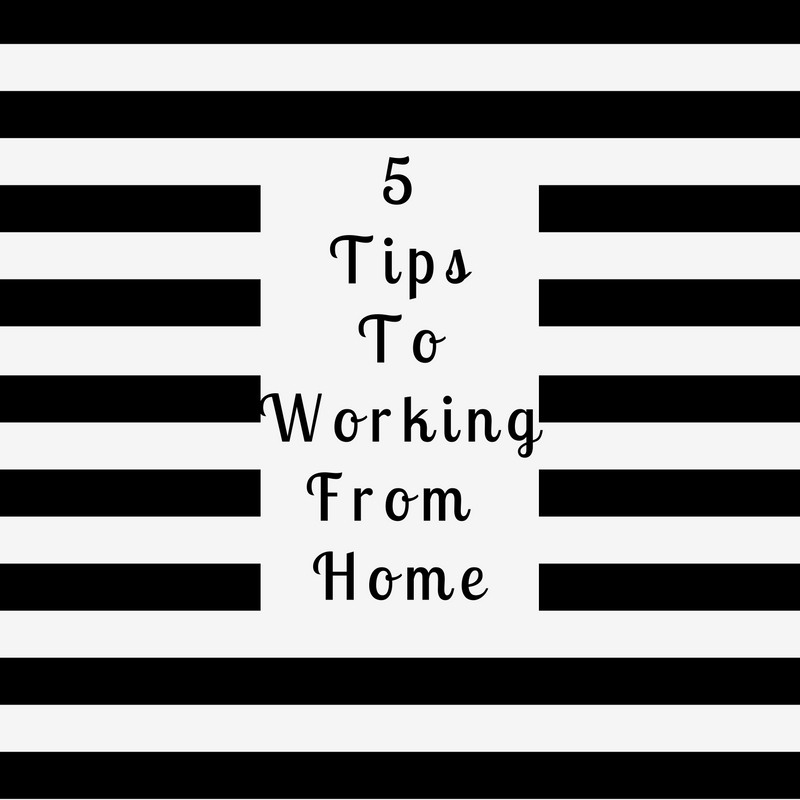 These tips are the crucial ones when it comes to being a productive home based worker. I myself still struggle with setting boundaries. Don’t get me started about making my friends and family understand my working hours and not interrupt me during those. It definitely might be the hardest to tackle!